The promise of the new year lies ahead. One way to help ensure that it will be a profitable one is to re-evaluate your company’s pricing strategy. 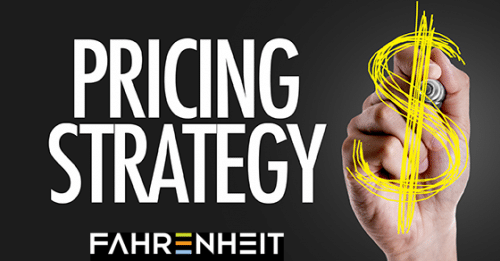 We recommend devising an approach that considers more than just what it costs to produce the product or deliver the service; your pricing strategy should incorporate your company’s specific customer value proposition balanced against what your target markets want and value — and how much money they’re willing to spend for it. As an example, raw material suppliers can calculate financial value if they know cost savings their offering will yield or the perceived value their product has in the end product. This should all be evaluated in the context of the broader market to see how competitors price and position their offerings relative to your company’s suite of goods or services. In terms of customer surveys and interviews, we recommend using a mix of open-ended questions that will draw out unexpected opinions and targeted questions about known points of differentiation. It is also important that the responses be evaluated honestly. Relying on a small sample can introduce bias and lead to disastrous consequences. It’s also smart to investigate your competitors’ pricing strategies using ethical means. For example, the owner of a retail chain might visit each of her local competitors to evaluate the selection, decor and service. Or a manufacturer might visit competitors’ websites and purchase comparable products to evaluate quality, timeliness, and customer service. We also recommend doing the same, covertly, in your own business and comparing any gaps. Remember, low-cost pricing isn’t the only way to compete — in fact, it can be disastrous for small players in industries dominated by large conglomerates. Your business can support higher prices than competitors do if customers think your products and services offer enhanced value. Suppose you survey customers and discover that they associate your brand with high quality levels and superior features. If your target market is more image-conscious than budget-conscious, you can set a premium price to differentiate your offerings. You’ll probably sell fewer units than your low-cost competitors yet earn a higher margin on each unit sold. Premium prices also work for novel or exclusive products that are currently available from few competitors — or, if customers are drawn to the reputation, unique skills, connections, or charisma that specific owners or employees possess. Remember to consider a combination of both real and perceived value; Yeti, as an example, commands a significant price premium based arguably more on lifestyle identification that on its superior performance features. Sometimes setting a low price, at least temporarily, does make sense. It can drive competitors out of the market and build your market share — or help you survive adverse market conditions. Being a low-cost leader enables your business to capture market share and possibly lower costs further through economies of scale. But you’ll earn a lower margin on each unit sold. Another approach is to discount some loss leader products to draw in buyers and establish brand loyalty in the hope that customers will subsequently buy complementary products and services at full price with higher margins. You also may decide to offer discounts when seasonal demand is low, when excess capacity exists in certain production areas, or when you want to get rid of less popular models to lower inventory carrying costs. Do your prices really reflect customer demand and market conditions? Pricing shouldn’t be static — it should evolve with your business and its industry. Whether you’re pricing a new product or service for the first time or reviewing your existing pricing strategy, we can help you analyze the pertinent factors and make an optimal decision. Contact us, we’re ready help. Jonathan Brabrand is a Managing Director at Fahrenheit. His passionate about helping businesses prosper and maximize value to their employees, customers, communities, and owners. Instilled with a spirit of entrepreneurism from a young age, Jonathan draws on his experience as a business owner, trusted strategic advisor, and investment banker to identify and overcome the challenges clients face.